32. Oxidative product formation analysis by flow cytometry (Robinson, Carter, Narayanan). Cytometry is characterization and measurement of cells and cellular constituents, most often used to immunophenotype cells - that is, to distinguish healthy cells from diseased cells. Flow Cytometry specifically is quite sensitive, allowing researchers to detect rare cell types and residual levels of disease, and as such has been the method of choice for important studies such as monitoring the blood of AIDS patients. For this reason, there is a great need for a practical, comprehensive manual that will be useful across a broad range of laboratories. 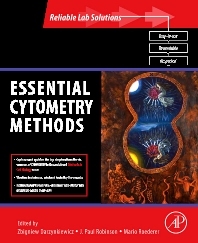 This volume, as part of the Reliable Lab Solution Series, delivers such a tool, offering busy researchers across many disciplines a handy resource of all the best methods and protocols for Cytometry to use at the bench. Highlights top downloaded and cited chapters, authored by pioneers in the field and enhanced with their tips, and pitfalls to avoid. Loaded with detailed protocols developed and used by leaders in the field. Researchers in and students of biochemistry, molecular and cell biology, developmental biology, and genetics. Director of the Purdue University Cytometry Laboratories and Professor of Basic Medical Science and Biomedical Engineering, Purdue University, IN, USA. Immuno-Technology Section and Flow Cytometry Core, Vaccine Research Center, NIAD, NIH, Bethesda, MD, U.S.A.